Today I am going to share another quick and easy recipe. This recipe takes 5 minutes to put together. 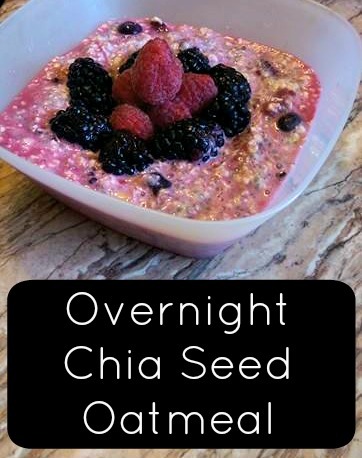 This is perfect to make up the night before and bring to work or school for a snack or breakfast. 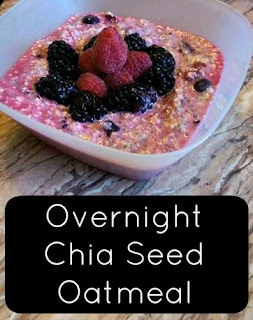 The chia seeds and oatmeal will keep you fuller longer and is full of lots of yummy nutrients. 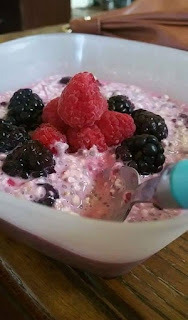 I did not include sugar in this recipe because the fruit adds plenty of sweetness for me. If you would prefer it a little sweeter add sweetened almond milk, add a little honey (or honey substitute), or add a little bit of sugar. The trick is to add the fruit in and let it sit overnight.This will let the chia seeds absorb the natural sweetness from the fruit.